Inspired by the terraces of my favorite American landscapers, I have been dreaming for a while of having an outdoor fire pit too. What is a fire pit? The idea is to have a central receptacle (often round), in which we will make a fire to settle around and chat warmly for the evening. It is not a barbecue (even if it could become very easily), it is rather a kind of campfire so sweet that allows creating a warm atmosphere in the garden. This kind of friendly brazier is very widespread in the United States. It is more contemporary and certainly more practical. 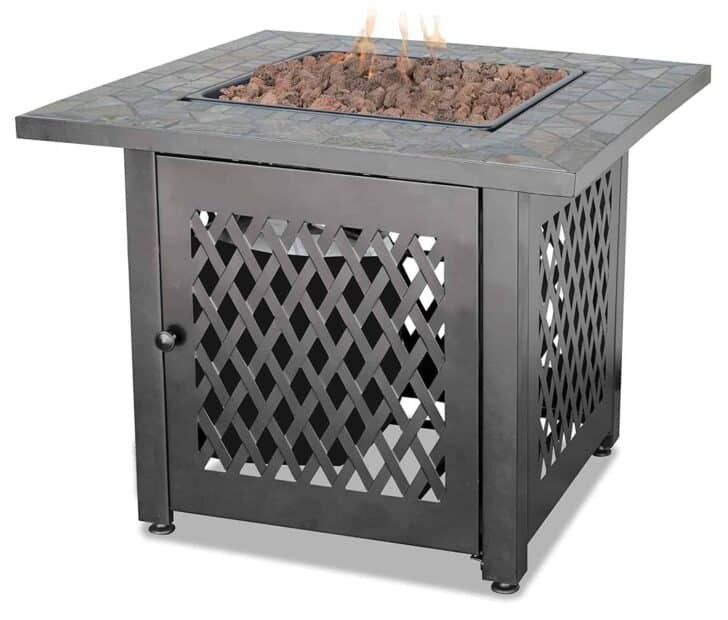 Design metal gas fire pit with lava rock made by a craftsmanship held to the highest standard. This item is handmade with a key and button start. Available for natural gas or propane. This is professionally built and coated that makes a very durable long lasting fire pit. C.A.D. has drawn layout and cut by plasma CNC. Certified welder. It has an interior metal frame and exterior is 14 gauge U.S. steel. Whether for ambiance or warmth, these ones of a kind fire bowl perfectly complete your outdoor space. Each is handmade in Spokane, Washington using Glass Fiber Reinforced Concrete; sturdy and won't crack. The Creme De La Creme model has it all! 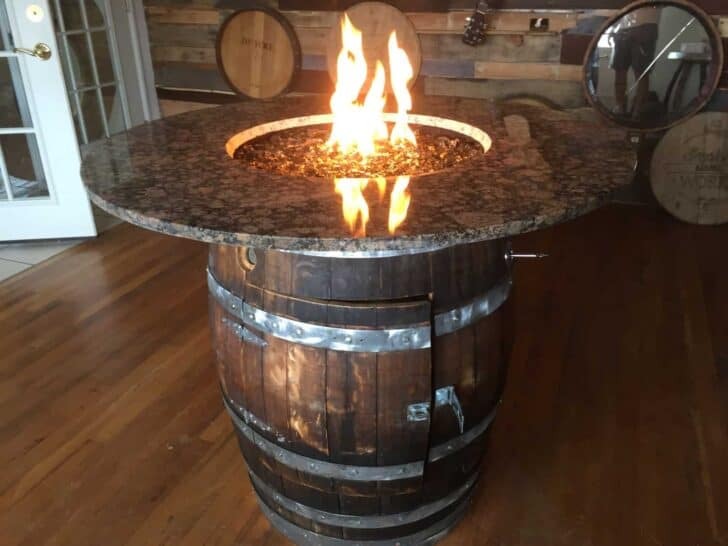 Your custom built wine barrel outdoor gas fire pit, stained and coated in polyurethane, Safety turn key valve, casters, choice of glass color or logs, a push button start and your choice of a wood or granite table top. Each Barrel starts out in its natural state and is custom built to your wants and needs as the buyer. With its slate tile and steel mantel, this handcrafted Endless Summer LP fire pit, by Blue Rhino, features the classic elements of high-end furniture, with the durability of weather resistant steel. Its decorative base cleverly conceals a propane tank and control panel, making it an attractive centerpiece for your outdoor living space. Complete with a 30,000 BTU stainless steel burner, you can enjoy all the ambiance of a classic fire, without the mess of tending ashes. Adding to the elegance, this unit includes lava rock, which beautifully accents its flames. The unit is easy to assemble with no tools needed and includes a 1-year limited warranty and protective cover. 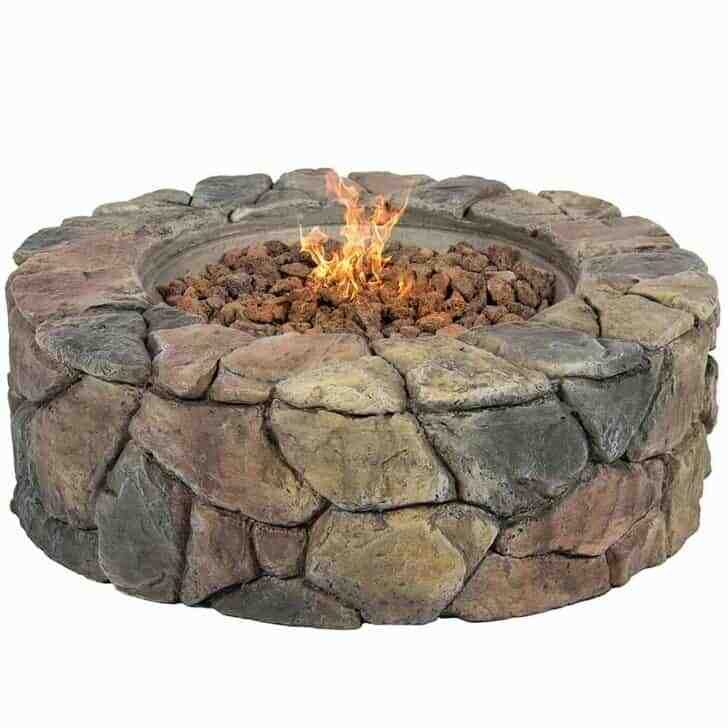 Best Choice Products presents you this brand a new Campfire Fire Pit. A stunning and natural Campfire Fire Pit for an ideal addition to your traditional-style home. Intended for outdoor use, this fire pit is supported by a solid frame, constructed from natural stonework. 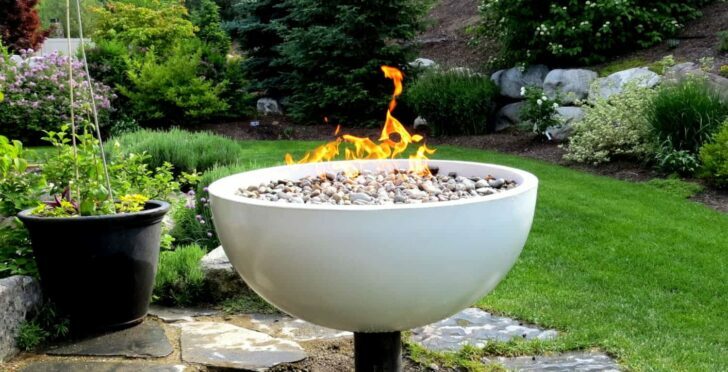 The round fire bowl features a stainless-steel burner and comes with a set of decorative rocks to use as a base. A quick touch of the spark-ignition button lights the grill while a gas-flow knob lets you control the height and heat of the flames. There has always been something primal and satisfying about sitting around an open fire, watching the flames dance while you enjoy the company of friends. The DestinationGear Portable Fire Pit makes that experience even better since you don’t need things like firewood, fire starters, patience and fire-building skill. 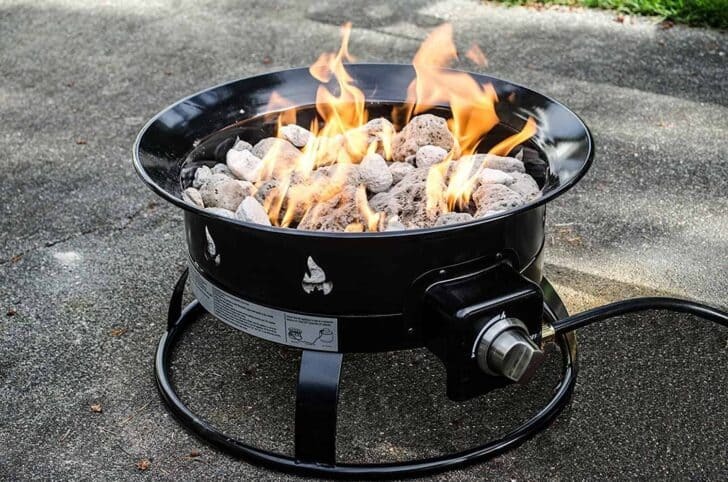 Just hook the Portable Fire Pit to a propane tank (not included), and fire it up. No fuss, no muss. Bonus: because propane is smokeless, you won’t need to keep shifting your position when the wind changes, or make lame jokes about how 'smoke follows beauty'. You just enjoy clean, fire-gazing fun in the company of friends. Easily stowed in your vehicle for rapid deployment for instant parties, the Portable Fire Pit includes a 10-foot hose to keep your propane tank safely out of sight, and generates 58,000 BTUs of fire goodness. Included decorative lava rocks are long-lasting, and complete the look for maximum visual appeal.